Good Boy Fluffy Bear Dog Toy is wonderfully plush cuddly bear, perfect as a comfort for puppies and dogs that like to snuggle when they snooze. Each bear has an internal squeaker making it even more fun for your dog. 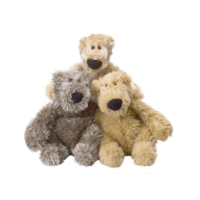 Provide your pooch with the perfect interactive play toy with a Good Boy Fluffy Bear. Please note colours and designs are dispatched at random and cannot be guaranteed.